“A bridge across the Atlantic, not a wall” - Welcome for the Canadian Ambassador - Atlantik-Brücke e.V. “We need a bridge across the Atlantic, not a wall “- this is how the new Canadian ambassador Stéphane Dion underlined the importance of German-Canadian relations at a welcome lunch in Berlin. About 23 guests met on September 26 to welcome the new Ambassador and former Minister of Foreign Affairs for Canada, Dion. The ambassador stressed that the connection to Europe and Germany is particularly important now. He reaffirmed his intention to contribute to making European-Canadian cooperation a success for both sides. Ambassador Dion hopes for good cooperation with Germany in particular because of Germany’s influence on international relations. 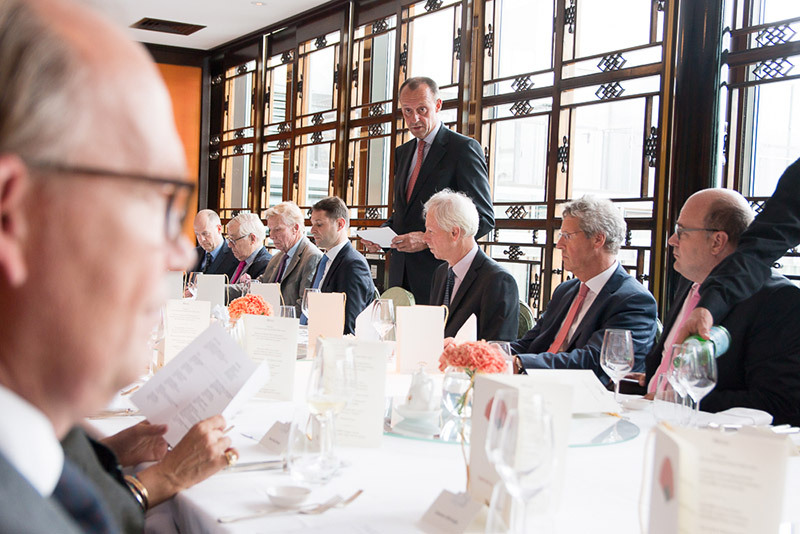 Friedrich Merz, Chairman of Atlantik-Brücke, emphasized the strong connection between Atlantik-Brücke and Canada. European-Canadian cooperation is an important part of the transatlantic relationship, not least because of the shared values. With the European-Canadian free trade agreement CETA, the partners had taken an important step towards actively shaping globalisation. The subsequent discussion focused on the integration of immigrants and the opportunities and risks of free trade. The ambassador explained how Canada deals with xenophobia and the population’s concerns about immigration. The government aims to reduce social inequality through taxation and to strengthen families. Integration of immigrants into Canadian society is a key issue. This is achieved without levelling cultural differences. The importance of the free trade agreement CETA was repeatedly underlined by lunch participants. The ambassador was optimistic that he would be able to work well with the new government coalition in Germany on free trade issues as well.